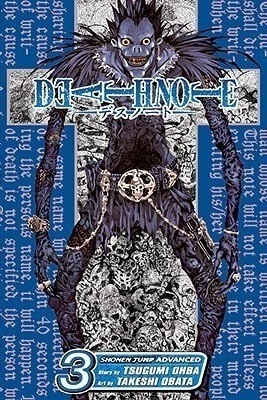 It's been such a long time since I've read Death Note. Luckily, volume 3 was easy to follow and the plot elements came back to me quickly. The thing I love most about Death Note is that the lines between good and evil are blurred. Actually, that's not quite true. Light's love for playing god is subtly but also strongly implied to be wrong. Where the lines get blurred is with who you root for. I dislike Light. He's arrogant and he enjoys killing people (even if they are mostly bad people). And yet I'm rooting for him to continue getting away with murder. L, the genius investigator, is a more prominent character in Volume 3. He's being set up as Light's equal and a hero. He reminds me a lot of the BBC version of Sherlock. Brilliant and socially awkward; someone who may be on the side of the angels but isn't one of them. I'm curious to see what I'll think about him in further volumes. Volume 3 has cemented my love for this series. It's not just about whether Light can kill people with the Death Notes. It's a chess game between two geniuses. And I can't decide who I want to win. I loved this manga series. I was on the edge of my seat watching these two play against one another. Glad you picked it up again and are enjoying it. I love this manga series, you should check out Bakuman, which is by the same creators. I enjoyed ready reading it, Keep posting good stuff like this.